Taste nicer eating with hand, you tell mamarazzi. Hehe. Oh. Hope the little fella survive and can leave soon. Too bad to read about your fishies, lil kitten ... :( Love, cat. muahaha!! siao ah?? how to eat BKT using hands?? maybe Small Kucing wanted to eat the dry version without the soup then can lah.. haha!! oh, Uncle SK saw the keropok on the plate, looks nice leh.. and this cheeky Small Kucing even scoop rice on top to eat together.. smart!!! So sad to hear that your fishes and tadpoles are no more except for one. I can see 2 hind legs and very soon it will jump away too. I thought the one in the last picture is your latest pet. So are you getting more fishes? 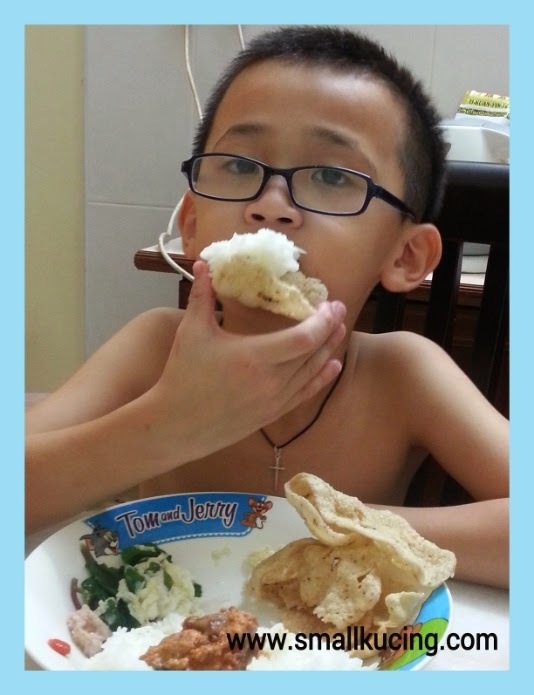 Take your little one for banana leaf lunch and makan-makan with hands. hmmm...small kucing ate too much malay or indian food with hands is it? hahaha..
Yipes! 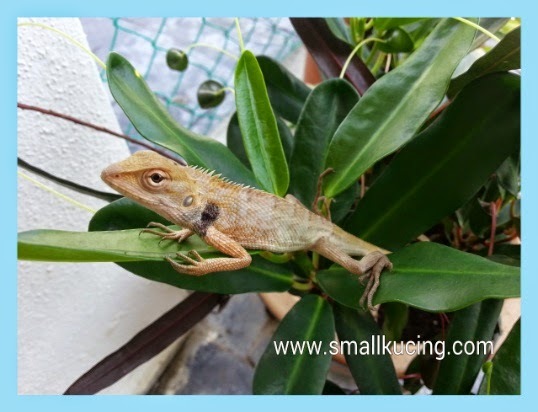 Are there many lizards in your yard? Maybe you want to eat with hands because of the stress of exams? A bit of regression to stress free times. Eeeeeeekkkkkkk!!!! Dangerous or not that thing! Where you stay ah? The land before time? Got pre-historic creatures one. I know...I know...I'm one like them as well!!! Hehehehehe!!! 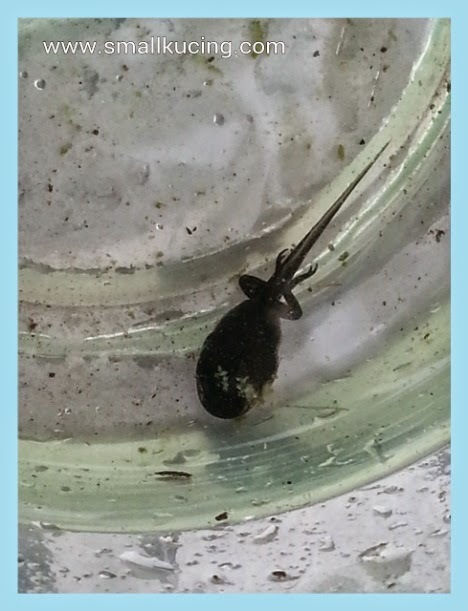 OMG that's a huge tadpole! It even got frog legs dy, so considered is half frog. Haha! Hmm...that's a giant lizard/gecko. I hear some people hunt for specific ones to sell to China, one guy fell off a tree in Sibu doing that. Maybe you adopt a dog better .... want one? Enjoy your weekend. Thought you got so many basi post, how come nothing to post about? Can throw away utensils already like that :) That cheeky fella is quite a pretty fella.